So what's the verdict: Is the movie better or the book? I would first say that i really enjoy watching the movie. There wasn't anything bad i could say about it, even when the creature wasn't truly revealed. I really would suggest anyone that read the book to check out the movie for just fun. So with that said I loved the book better than the movie. The book is a must-read and I hope anyone reading this would take a chance at it (whether you like sci-fi or not). It's an easy read. The movie is great as well so if you want to check that out first then go right ahead. Years later after watching the first movie of the hunger games (which I enjoy even with the shaky cameras). The second movie arrived and blew the first movie out of the water when it came to the box office numbers. So when it comes down to it which one was better. The book or the movie. You guys might be surprised by my answer but I really enjoyed the movie more, way more than the book. My experience of the book wasn't too pleasant. To be honest i dislike it and thought it was an inferior sequel to a really good first book. However, when the movie came out, i revisited the book. I saw it in a different light and liked the book better than i did when i first read it. Still it was the movie that made me better appreciate the book. So, in this case, the movie won over the book for me. In fact it was because of book two that I wasn't eager to read the third book in the series. I picked that one months later due to how disappointed book two ended in a cliffhanger. I have to say that I read the book before I watched the movie. From the opening chapter the author's words really captured me and enthralled me to Pat's world. The title of each chapter was quite clever and captured the mood as well. This book was really good and had a bit of twist at the end which i didn't expect. so after I finished reading the book i couldn't wait to watch the movie. I heard a lot of people that watched it loved the movie. I wasn't surprised by this since the book that it came from was really gripping and interesting. So my expectation was high when i checked out the film. So, the start of the movie, it had some similarity to the book which I thought was okay but from mid- way to the end there were major changes which surprised me. I couldn't believe they didn't stick to the source material as it read like an amazing movie but instead the movie took its own course that was a pale comparison to the book. Sadly, I didn't enjoy the movie adaptation. If I've watched the movie alone, maybe i would have enjoyed it a bit but reading the book and knowing what they left out and the changes they made overall made me not like the movie at all. In fact I really dislike it but the casts of the movie did an awesome job especially Jennifer Lawrence (as you can see from the movie clip above). I was really irritated about the unnecessary changes and how the movie told the story. I would just say that it's better to watch the movie first before reading the book. Perhaps that way you would enjoy both of them because reading the book first (from my experience) ruined my enjoyment of the movie. so clearly you can tell that i think the book was way better than the movie. Case closed. Man The Ruins is quite a read and a movie experience to watch. I'll just say that the concept is original and quite creepy. I first watched the movie before I discovered that it was based on a book. I would never forget the events that occurred from this movie. Let me just warn you that there's a lot of gore in it. So if you don't like to see a lot of blood and flesh-ripping from the body then you might want to avoid watching it. Reading the book might be the way to go but that too has a bit of description that might make you skip a sentence or two. The movie most certainly have cringe-worthy moments that will give you the creeps or make you cringe.So if you want to watch something out of the usual or the norm then definitely go watch The Ruins. Anyhoo, after my movie experience of The Ruins i read the book. I still have somewhat similar experience that I had with the film with the book. I got to know the character better and felt their struggle dealing with something very alien to them. So which is better? 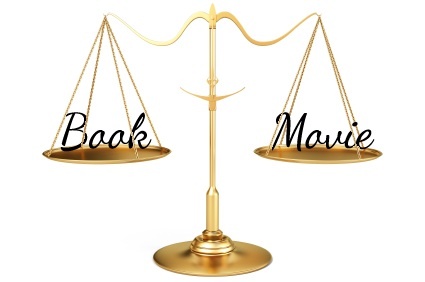 the book or the movie? This one was kind of hard to choose an answer to because both medium had their strengths and weaknesses (sadly more weaknesses than strengths). I wouldn't mention them because it might make this blog post quite lengthy and I know you all are too busy to be reading my rant on something so here goes my answer is......the winner is the..... B-O-O-K. I believe the book we get to know the character better (even though their decision making was quite puzzling and at times stupid).I felt more connected with the character from the book than for the movie. I think reading the book would give me quite a tense experience and make you want to watch the movie anyways. Also the villain was much believable and convincing in the book than in the movie. The movie, although had its moments, wasn't as engaging as the book. (even though both movie and book, in depth, had its flaws when it came to character development and story plot.) So definitely read the book first before you watch the movie. First of all this is my personal opinion and not what the majority thinks is better. You might disagree or agree with my choice (which is perfectly fine) but i would give my reason why and leave it at that. So I hope you enjoy reading this. Now the first book i would be focusing on is Jurassic Park. The book was published in 1990 and became a best-seller. It gained more popularity after the movie release in 1993. So here's the verdict for which one i think is better. And my answer is.......The movie. I know, i know the book should/usually beat the movie especially one that was beloved by fans. I have to say that in this case the movie slightly beat the book. I'm gonna explain my reason so don't fuss yet. Okay first of all the beginning of the book in Jurassic Park wasn't well focus.It was quite muddy at times yet i love how mysterious it was. I love how the author made each events gave signs of what was to come. However, I thought the movie did a better job drawing us into the story: It went straight to the point. The book did a superb job in world-building and explaining the science behind the dinosaurs existence. The characters in the book weren't as gripping as in the movie especially when it came to the kids. The book kids were quite annoying and appeared sort-of unlikable. The movie kids, on the other hand, were likable and down-to-earth. Overall, if you like the movie then you should definitely read the book. I think you would greatly appreciate the movie more and have a greater scope of the Jurassic universe. The changes that the director(or whoever in Hollywood made) were the right choices and definitely didn't hurt the core of what the book was trying to say. So even though the movie-version is better in my opinion, i would urge you to read the book. This section of my blog is just to express my opinion on books and movies. It isn't meant to discourage you to avoid one and choose the other. So I urge you to always read books (despite anyone's opinion of it) and let your curiosity check out the movie-version of what you just read.